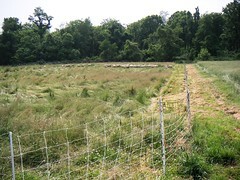 Fencing is usually the largest capital expenditure on a sheep farm. 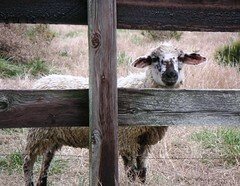 In many cases, existing fence can be modified for sheep-raising. 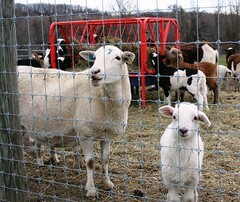 Two types of fencing are required on sheep farms: perimeter and interior fencing. Perimeter fencing is usually installed around the boundary of the property (or grazing area) and is the first line of defense against predators. It is intended to last for a long period of time and should be constructed of high quality materials. Suitable perimeter fences for sheep are multi-strand, high-tensile, electric fences and woven wire fences with electric offset wires and barbed wires at the top and bottom of the fence. Interior fences (or cross fences) are used to subdivide fields into smaller areas (paddocks) for grazing. Interior fences may be constructed from permanent, semi-permanent, or temporary fencing materials. While an interior fence does not need to deter predators, it does need to be good enough to keep weaned lambs away from their dams and/or rams away from ewes. 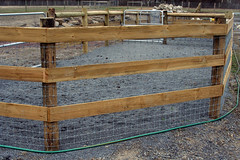 Temporary fencing can be used to enclosed areas for temporary grazing (e.g. a corn or wheat field). High-tensile electric fences last for a long time, are relatively easy to construct, and cost less than other types of fencing. Whereas cattle can often be controlled with 1 or 2 strands of electric wire, sheep require multiple strands, not so much to keep them in, but to keep potential predators out. 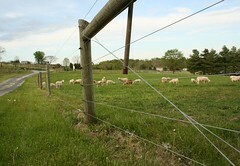 Five, six or seven strands of 12 ½ gauge high-tensile wire is common for sheep fences. The bottom wires of the fence are more closely spaced than the top wires. Wire spacings of approximately 6, 5, 5, 8 and 10 inches are typical. In areas where there is relatively even rainfall and some green vegetation most of the year, it is recommended that all wires be hot. Ground return wires are recommended where there is low rainfall, stony and dry soil conditions, or where the ground is frequently frozen or snow covered. Switches can be installed so that wires can be turned off if the situation warrants. For example, it is useful to put a switch on the wire closest to the ground, so that it can be turned off if there is too much vegetation on the fence line. High-tensile fences are made with smooth wire that is pulled to an initial tension of 250 pounds. They require strong corners and end braces to achieve adequate tension. The wire is held on fence posts with staples. These staples are driven at a slight angle off of vertical so the slash cut points steer the staple into different grains of the wood. The staples are not driven tight against the wire, but instead allow freedom for the wire to move during tensioning, temperature changes, or livestock pressure. Poor grounding is the leading cause of electric fence failures. An electric fence must be properly grounded so that the pulse can complete its circuit and give the animal an effective shock. It is important to follow manufacturer's instructions for grounding electric fences. A minimum of three ground rods should be used for each energizer. It is estimated that 80% of electric fences in the U.S. are improperly grounded. A voltmeter is an inexpensive tool that measures the charge the fence delivers and can be used to trouble shoot electric fence problems. 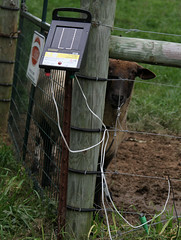 The charger (or energizer) is the "heart" of the electric fence system. It converts main or battery power into a high voltage pulse or "shock" as felt by the animal when it touches the fence. In the past, electric fence chargers shorted out easily. Today's chargers are low impedance, meaning they are designed to effectively shock though vegetation and other foreign materials touching the fence. 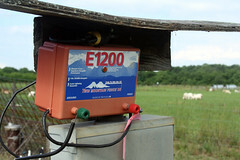 A 4,000 volt charger is usually sufficient for sheep. The number of joules needed depends on the length of the fence, the number of electrified wires and the severity of conditions. A joule is the amount of energy released per pulse. As a general rule, 1 joule will power 6 miles of single fence wire; 4.5 joules is usually adequate for 20 to 50 acres. Lightning strikes can damage energizers. Surge protectors and lightening arrestors are recommended to minimize energizer damage. High tensile electric fencing requires periodic upkeep. Fence wires should be kept properly tensioned. Weeds and brush should be cleared from the fence line by spraying or mowing. It is important to note that an electric fence much more of a psychological barrier rather than a physical one. 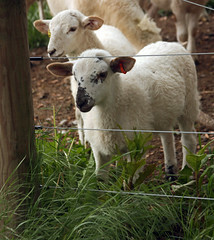 Sheep and lambs must be trained to respect electric fence. Once trained, they will usually respect the fence even if it is off for any reason. 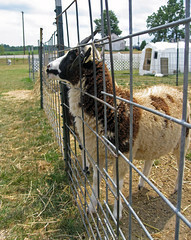 Woven wire is the traditional type of fencing for sheep. It consists of horizontal lines of smooth wire held apart by vertical wires called "stays." The distance or spacing between horizontal line wires may vary from as close as 1 1/2 inches at the bottom for small animals, to as wide as 9 inches at the top for large animals. In general, the spacing between wires gets wider as the fence gets taller. Stay wires should be spaced 6 inches apart for small animals and 12 inches for large animals. 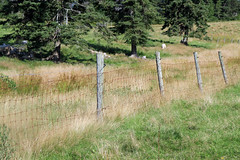 A four-foot high woven wire fence, with one to two strands of barbed or electric wire along the top of the fence makes an excellent perimeter fence for sheep. A strand of barbed wire along the bottom of the fence will serve as a "rust" wire and extend the life of the fence. 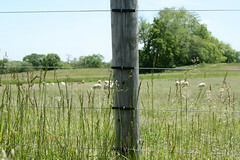 An electric "offset" wire at shoulder height will keep sheep from poking their heads through the fence. Another offset wire, approximately 7 inches up from the ground will help to deter predators that try to go under fences. The advantage to woven wire fences is their effectiveness as a visual barrier. Their biggest disadvantage is their cost. Mesh wire fences have smaller openings than woven wire fences. Two types of mesh wire are the diamond mesh, which uses two wires twisted together in a diamond formation with 2-inch x 4-inch openings, and the square knot mesh, which has single horizontal lines with the wire spaced 2 to 4 inches apart. Because they are more expensive than woven wire, they tend to be used for confinement fencing, such as corrals and barnyards. Barbed wire fences are generally not recommended for sheep because they may not effectively deter predators and they can cause injury to livestock. Sheep can get their wool snagged in the barbs. Barbed wires should not be charged due to their poor conductivity and safety for the animals. When barbed wire fences are used they should contain at least 5 to 6 wires, preferably 8 to 10 closely-spaced wires with several twisted vertical stays. The best use of barbed wire is to rejuvenate old fences or enhance woven wire fences. It is common to install 1 or 2 strands of barbed wire along the top of a woven wire fence and/or one wire along the bottom of the fence. Rail fencing will generally not contain sheep or repel predators unless electric wires are placed between the boards or the entire fence is covered with woven or mesh wire. Rail fences are expensive to build and maintain. On the other hand, permanent, wooden fences are often used for corrals and barnyards. 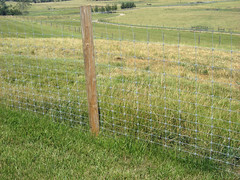 Fences made from hog wire or chain link, while effective are generally too expensive to enclose large parcels of land. They work well for corrals and barnyards and other high pressure areas. Old fences can last many more years by attaching offset brackets and an electrified wire on each side of the old fence. Single off-set wires should be set at two-thirds of the height of the animals to be controlled. The old fence can serve as the ground wire and will work well to complete the circuit and control the sheep. Fences can be built at different heights. Commercial fencing products come in different heights. Most predators climb, go through, or go under fences, as compared to over them. There are many types of fence posts. Fence post selection should be based on the specific fencing need. For example, treated wood posts are best for permanent boundary fences, while steel or fiberglass posts are suitable for temporary fences. Wood posts are highly variable in size and shape. Strength of wood posts increases with top diameter. Post strength is especially important for corner and gate posts, which should have a top diameter of at least 8 inches. Brace posts should be 5 inches or more in top diameter. Line posts can be as small as 2 1/2-inches in top diameter, although larger diameter posts make fences stronger and more durable. T-posts and landscape timbers can also be used for line posts. Steel posts offer a number of advantages. They are lighter in weight, fireproof, extremely durable, and relatively easy to drive. They also ground fence against lightning when in contact with moist soil. Fence posts must be long enough to accommodate fence height, depth of setting, and an additional 6 inches. One of the advantages of high tensile fencing is that it requires less fence posts. Most fences use a post spacing of 8 ft. whereas the line spacing on high tensile fences varies from 16 to 90 feet. Post spacing needs to be adjusted for topography, livestock pressure, post size, wire tension, and use of poly spacers, battens, or droppers. Source: Estimated Costs for Livestock Fencing, Iowa State University, updated 2005. Wire may be galvanized steel, aluminum, or aluminum clad steel. Several gauges and breaking strengths of wire within the different wire types are available. Steel wire is covered with zinc, commonly called galvanizing, to protect it from rusting. More zinc means more years of service before rusting starts. High tensile wire typically carries three times as much zinc coating as barbed or woven wire, which accounts for its long expected life. Aluminum wire is lighter, more conductive, and never rusts; however, the breaking strength of aluminum wire is only about one third that of steel wire. A combination of these two materials is also available as aluminum clad hi-tensile steel. This is a hi-tensile steel wire with aluminum coating in place of galvanization. This wire has the high breaking strength of steel wire and the conductivity of aluminum. 12.5 gauge wire is usually the wire of choice for most permanent fences, while lighter gauges can be used for internal subdivision fences, both permanent and temporary. Insulators are a fundamental component of any electric fence. They are made from a non-conductive material, such as porcelain or plastic and form a barrier between the electrified wire and its support material to prevent current leakage to the ground. 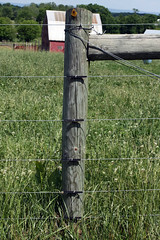 Plastic insulators are the most common type of insulator used on electric fences. They are cheap and easy to fit. Porcelain insulators have the best insulation properties, and if good quality, are the strongest. They are the most expensive. Plastic tube insulators are useful for taking a line wire around a post. Off-set insulators are used to attach a wire to a new fence or a non-electric fence. Cut-off switches are used to isolate parts of a fence without the need to turn off the energizer. Different materials can be used to construct temporary electric fences: high-tensile wire, polywire, polytape, and electric netting (or net fence). Light weight, high-tensile wire (17 or 19 gauge) is most suitable for semi-permanent fences that will not be moved constantly. Two or three wires is usually sufficient to control sheep and lambs. The most common materials used for temporary fencing are polywire and polytape. Both are combinations of metal and plastic filaments. Polywire has the appearance of heavy cord or plastic baler twine. It comes in several colors or combinations of colors. Several grades are available depending upon the number of filaments and gauge of the conductor. Most polywire sold is either 6 or 9 strand. Polytape similarly comes in several options and should be purchased on the basis of the number of filaments and the quality of the plastic weave. Compare to polywire, tape has the advantage of greater visibility, which leads to quicker animal recognition and training to the fence. Polywire is less expensive and lasts longer. Poly products come in reels with various capacities and with different locking systems. If you plan to move a fence, reels are an absolute necessity for polywire and polytape. Plastic step-in posts are the most common line posts used with poly products. They are the easiest to use, especially if the fence will be moved frequently. The pre-molded loops provide plenty of flexibility for wire spacings. The metal re-bar posts are cheaper and last longer than plastic or fiberglass posts. They require insulators to hold the wires and can be difficult to get in the ground when the soil is hard. Fiberglass posts are best suited to situations where the fence will not be moved frequently. Drive caps are usually used to hammer fiberglass posts into the ground. A spent shotgun shell also works well Wire clips or plastic insulators are used to hold the wire in place. All types of posts can be difficult to install during the winter. Metal t posts are stronger and last longer than the other temporary posts, but they cost more and require more labor to install and remove. Electric netting combines traits of net-wire and electric fencing, providing a formidable mental and physical barrier in a portable format suitable for temporary or semi-permanent fencing of pastures. It is constructed of polywires and plastic twines. It is usually supplied in fixed lengths of 50 or 25 meters with support posts already installed. Netting is lightweight and easy to install. Compared to other temporary fences, electric netting provides greater protection from predators. However, with electric netting, there is some risk of animal entanglement, especially young lambs and animals with horns. Late updated 17-Jan-2012 by Susan Schoenian. Copyright© 2011. Sheep 101 and 201.